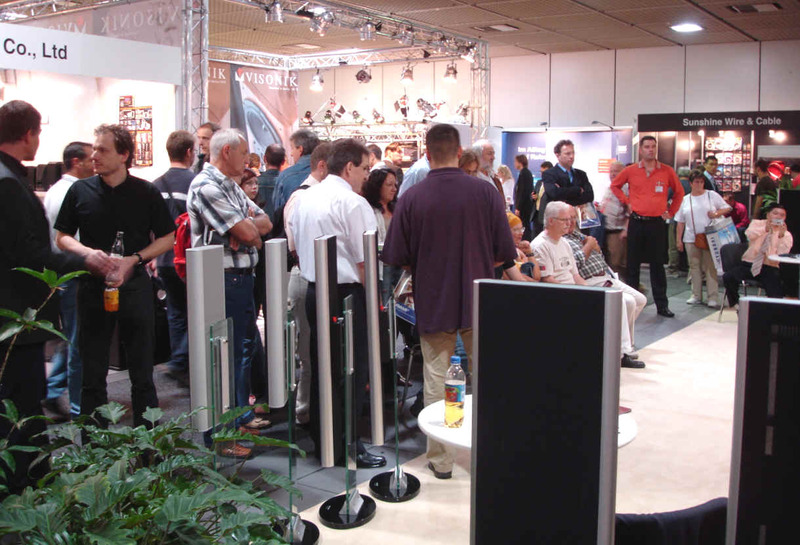 Acoustat was echoed strongly by the people in the first participation in IFA. IFA was started in 1924, from the last session ( IFA 2003)of counting , it had the history of 78 years. 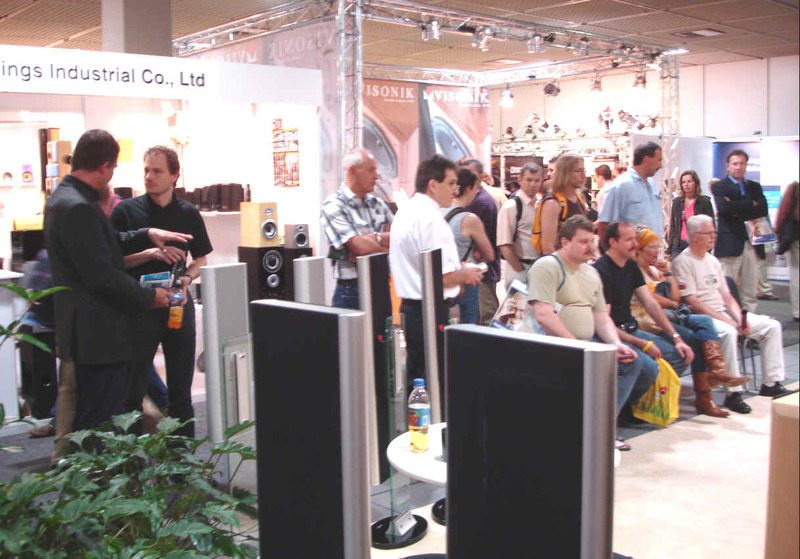 IFA was one of the most famous professional exhibitions. It was held one session every two years. Sponsored together by the famous Berlin International Exhibition Co. Ltd. (Messedamm) in the world and German Entertainment &Communication Electronic Association(GFU). It made sure of the developing direction for the electronic consumption products industry, transferring the newest developing instance, made the manufacture and trade industry see such development clearly. It was the spot of exhibiting the latest products of the different kinds of electronic appliance consumption products, represented the latest developing tide of the electronic consumption products industry. Acoustat static sound from Italy, 1962, attended IFA Berlin 2005 for the first time this year, was echoed strongly by all circles of the European; Acoustat was the earliest researching &developing and manufacturing static sound enterprise. It was situated the unexampled elevating station in Europe even more in the world. 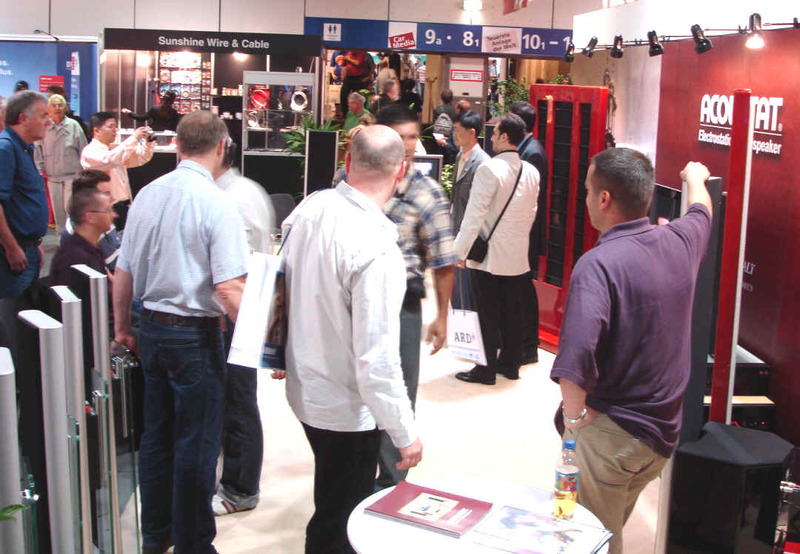 This time it appeared in IFA, attracted the hotly pursue and praise, the people in the scene came and tried to listen to the sound one after another, especially the eldest generation fanciers, they feel strongly with the “ old friend” had returned Europe after many years, were familiar with it very much; While the sensitive dealers were interested it very much. The dealers who were from Belgium, Holland, France and German made the orders numerous and complicated, required to attend the range of Acoustat strongly! 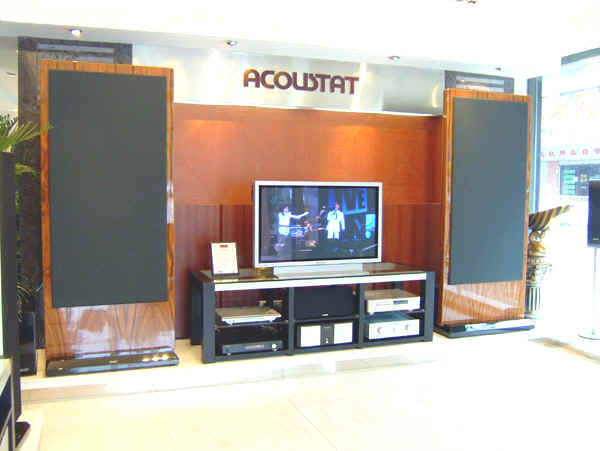 While the young fashions were convinced by the Style Z1 that named big flagship of the biggest static sound box in the world that was researched and produced lately by Acoustat this time. The price of Z1 big flagship serial static sound box was about 60 thousand European Dollar, the dizzy” cherry red “color and pure cherry wood box body, was high 1960mm, was wide 850mm, but its depth was only 105 mm, to the expressive force of the sound , it showed the vast stage effect incisively and vividly even more! Acted as one of the brightest highlights, ZI flagship serial static sound box returned with carrying the reputation in IFA! When the exhibition was started, attracted numbers of people that love music. 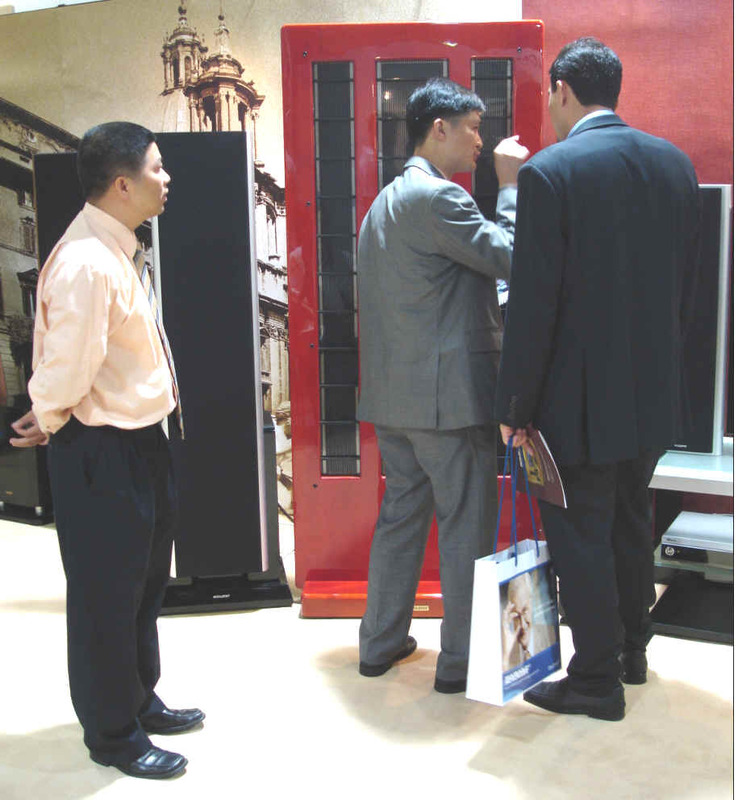 The zealous traveling merchants were very interested in the Acoustat products, came and learned the characteristics of the products carefully one after another. The stream always surged in front of booth of Acoustat, no pomp before. ● In 1962, Jim Strickland established the ACOUSTAT Static Lab. ● In 1964, ACOUSTAT proposed the technology of using graphite-painted plastic diaphragm to replace the metal diaphragm. ● In 1976, the 1st static speaker X-type was developed. ● In 1978, amplifier M-10 of qualifier vacuum tube. ● In 1982, TNT 200 amplifier and TNP 200 preamplifier. ● In 1984, 1+1 type of products with new design principle were launched into the market and became very popular. ● In 1985, David Havel, the designer of 1+1, won the prize for the best individual design. ● In 1990, new products of 1100, 2200, 3300, 4400, and 6600 were launched into the market simultaneously and ACOUSTAT entered the period of maturity. ● In 1993, to enlarge the manufacture scale, the plant of ACOUSTAT was moved from the United States to Italy, where two factories were set up. 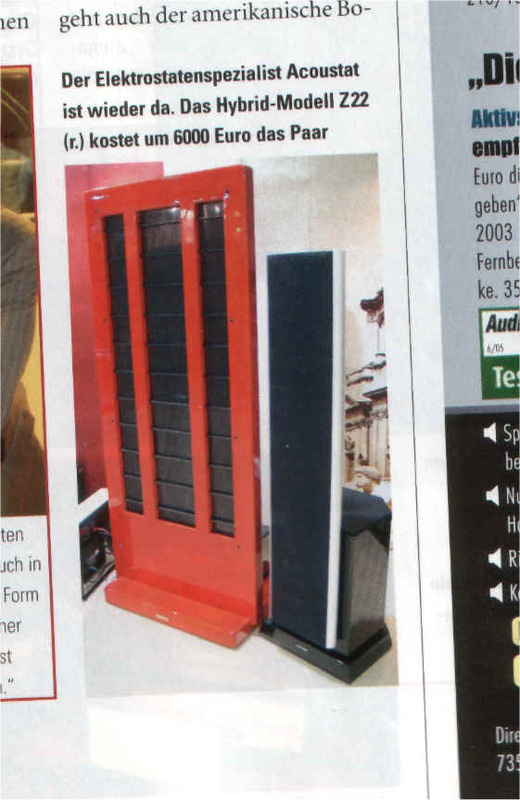 ● In 1994, after the re-location of the ACOUSTAT factories, new products 1200 were launched into the market. ● In 1995, 1300 and 1400 of composite design were launched into the market. ● In 1999, Asian Static Technology Research Center was established in China, starting the global development of ACOUSTAT. 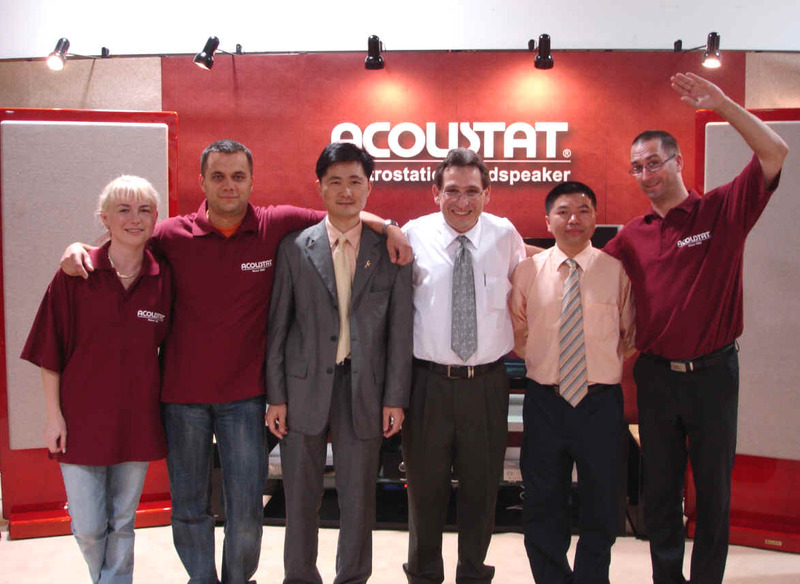 ● In 1999, ACOUSTAT established branches in Holland. ● In 2001, the largest static speaker production center was established in China, which was one of the first of its kind entering China after China’s entry into WTO. ● In 2002, Planning and Promoting Organization of ACOUSTAT (China) was officially established. ● In 2003, market in China area was developed and products began to be introduced to the United States. ● In 2004, ACOUSTAT Z22 was awarded the prize of the best flagship. 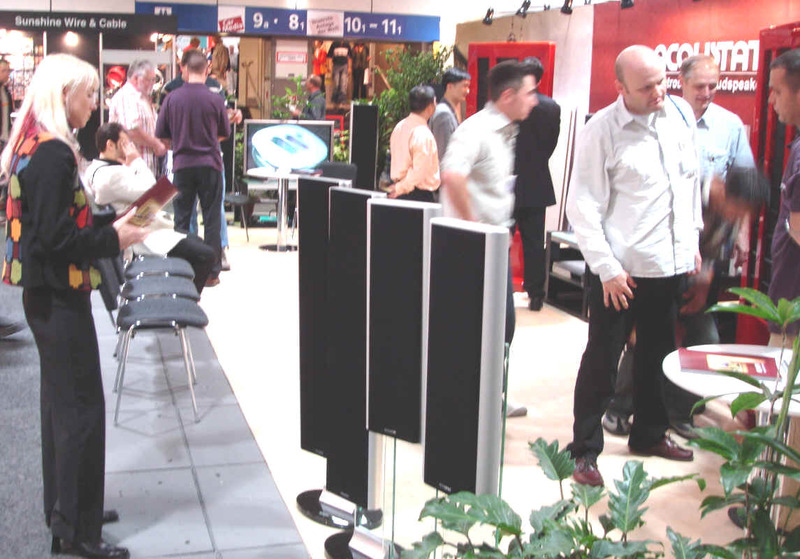 ● In 2005, ACOUSTAT launched new products: 2005 enhanced version Z1100, Z22, Z2006, Z2008, Z2010, and the biggest Z1 series flagship electrostatic loudspeaker system.